November 26, 2014 – Happy Holidays! Tiffany from Eat at Home here today and I’ve brought my sprinkles, frosting and a couple of easy recipes to share. We love crispy treats at our house, but I wanted to give a different spin on them for Christmas with these two varieties – Christmas Spice and Snickerdoodle. Christmas Spice Crispy Treats have a bit of vanilla added and a pinch or two of nutmeg. They have a subtle flavor that is a step up from the traditional recipe. Snickerdoodle Crispy Treats start with cinnamon crunch cereal instead of crisp rice cereal. The cinnamon flavor spreads throughout the marshmallow part, making these really tasty. For Christmas, I’ve added red and green colored frostings, too! Kids can help with making the treats, cutting them out and decorating. However, the cutting out part does require a bit of strength, so young children will need help with this step. I found that these steps work best for cutting out. o Butter the cookie cutter edges. o Press it most of the way into the treats. o Cut around the outside of the cookie cutter with a knife. Frosting can be spread with butter knives or spoons. You can also put frosting in sandwich bags and snip off the tip of the corner. Place small bowls of colored frosting and sprinkles on the table in easy reach of everyone. Consider skipping a tablecloth. They tend to slide around, especially if you have little ones standing in a chair and leaning over the table. Bare tables keep supplies steady and make clean up easier. 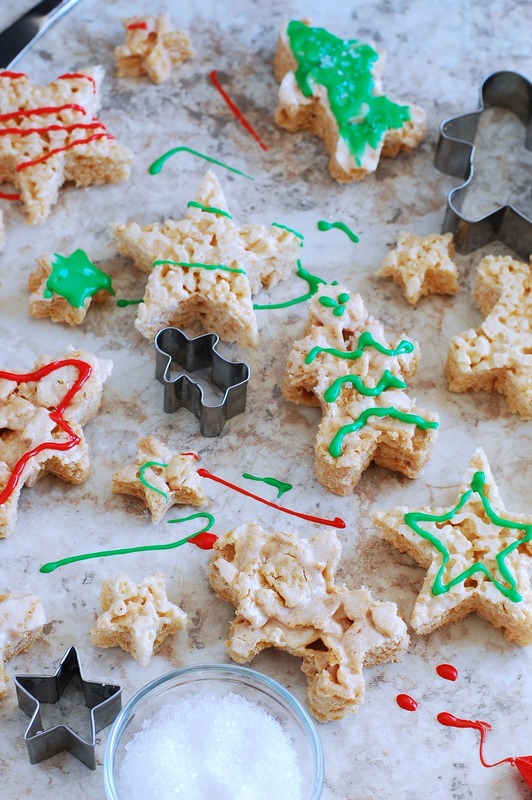 Tip: These recipes have less cereal in them than other crispy treat recipes. I’ve found that a higher marshmallow to cereal ratio helps the treats hold together better for cutting into shapes. Melt butter over low heat in large saucepan. Add marshmallow and stir until completely melted. Remove from heat and stir in vanilla and nutmeg. Stir in 1 cup of cereal until thoroughly coated with marshmallow. Add more cereal and stir until all cereal is completely coated. Pour into greased 8” square pan. Put powdered sugar in a bowl. Add 1 Tbs. of milk and stir with a spoon. Continue to add milk in very small quantities, until frosting is the consistency you like. Recipe and Photo Courtesy of Tiffany King, Eat at Home. I am so thankful that Aldis opened up a store in Carmel.